The rapper/singer/drummer formerly known as Breezy Lovejoy has a back-log of jams. We dug around for more on .Paak, formerly known as Breezy Lovejoy, and found a kid from L.A. with a million styles and a wild haircut. Here's a few choice cuts from the kid to prep you for this week's big stream. Anderson .Paak DJs and produces as one half of NxWorries alongside Beat Construction alum Knxwledge. His older stuff lends itself to that strain of break-looped, Dilla-indebted beat work, that's found a new home among L.A. studio rats. Last year's Venice album found .Paak trying on harder and faster sounds: the marching hi-hats and microwaved vocals that dominate nightclub sets across coasts. He does R&B, too: cuts like "The City" that straddle many lines, and might sneak in a Riperton interpolation if you listen close enough. .Paak holds his own as a producer as well: he helmed an entire album for Watsky, a rapper/spoken-word artist. 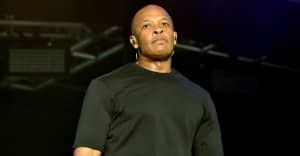 Overall, he's the kind of young artist that would snag Dr. Dre's attention: non-traditional and unpredictable, but fluent in the classic sounds that reared him. We're excited to hear how he's helped out on Compton.